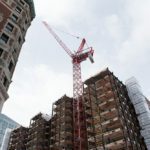 Suffolk Construction placed a 150-feet-tall tower crane on top of the Little Building construction site on Sunday as part of ongoing renovations. In an email, Director of Construction Management Michael Faia wrote the crane will place panels that will compose the building’s exterior. He estimated the crane will be removed sometime between November and December of this year. Little Building is progressing on schedule, and the weather has not impacted construction to date, Faia said. The college still plans for Little Building to open in time for fall 2019 move-in. 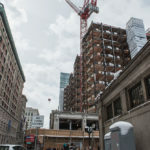 Emerson College Police Chief Robert Smith wrote in an email to the Emerson community that a strip of Boylston Street stretching from South Charles Street to Tremont Street would be closed from midnight on Saturday until 8 p.m. on Sunday due to the crane’s installation. Pedestrian traffic passing through campus was also redirected away from the Little Building. ECPD officers were assigned to the street as part of the closure. Residence halls officially reopened Sunday at noon following their spring break closure. Students have complained about construction noise from the Little Building and the Colonial Theatre in the past. Last month, administrators met with students affected by the noise to discuss possible solutions. Freshman Nicholas Rempe is a Colonial Building resident whose window faces the Little Building. While he said he has not noticed an increase in the amount of noise since the crane’s installation, he said the street closure made moving back in after spring break inconvenient. “[I] had to walk down past my building, then cross another street,” he said. Rempe moved in early on Saturday. Rempe also said he felt communication between the college and students about construction could be stronger. “I feel like we could be made aware better,” he said. Colonial residents received emails on March 12 and 13 from Associate Dean for Campus Life Erik Muurisepp and Colonial Building Residence Director Michael Barcelo containing details pertaining to construction. Barcelo’s email contained a document from Suffolk Construction detailing the work planned for the building across a two-week period. Muurisepp’s email provided greater details on the continuing renovations to the Colonial Theatre and Little Building.